The Law Firm of Marco and Marco was founded by Richard J. Marco Sr. Since its inception in 1972 Marco and Marco has extended its practice to involve Mr. Marco's sons into the law practice. To date Marco and Marco Attorneys at Law houses several attorneys that work in various law areas. 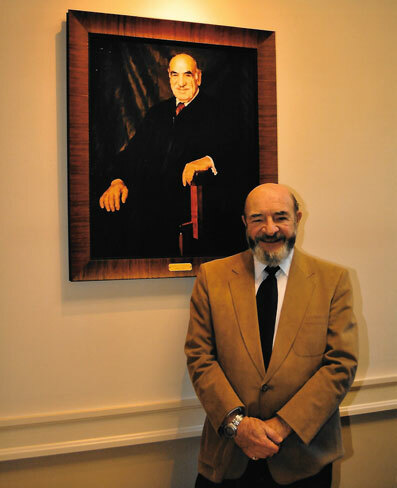 Richard J. Marco, firm founder, with a portrait of his Uncle, Federal Judge Anthony J. Celebrezze in the background. Richard J. Marco pictured with President John F. Kennedy at the White House, circa 1962. American Democratic politician who served as 49th mayor of Cleveland, OH and cabinet member with Kennedy & Johnson and U.S. appeals court judge. CLICK HERE for PDF of The Plain Dealer 02.26.95 Article on his 45 years of service. CLICK HERE for the Letter Accepting Resignation of Anthony J. Celebrezze as Secretary of Health by President Lyndon B. Johnson. CLICK HERE for the Ohio Northern University - Alumni Feature: The Honorable Anthony J. Celebrezze, Sr.
CLICK HERE for the Anthony J. Celebreeze article in the 'This Is The Times: Cleveland Centennial' blog. CLICK HERE for "Celebrezze Is Honored, Restates Faith in Fellow Man"
CLICK HERE - Correspondence between Anthony J. Celebrezze and President John F. Kennedy donated by Richard Marco Sr.
CLICK HERE - Correspondence between Anthony J. Celebrezze and Robert F. Kennedy donated by Richard Marco Sr.
CLICK HERE - Correspondence between Anthony J. Celebrezze and President Lyndon B. Johnson donated by Richard Marco Sr.
CLICK HERE for Cleveland.com - Whatever happened to the $121 million makeover of Cleveland's Anthony J. Celebrezze Federal Building? CLICK HERE for Congratulations Mr. Celebrezze! CLICK HERE for actual phone conversations between President Lyndon B. Johnson and Anthony J. Celebrezze during the latter's tenure as Secretary of Health, Education and Welfare. The pertinent dates to search for are March 9, 1964, March 25, 1964, May 27, 1964, and Nov. 3, 1964. CLICK HERE for a Newsweek story on President John F. Kennedy's years in the White House following the president's assassination from the December 3, 1963 issue. CLICK HERE for another story on the Kennedy administration, also from the December 3, 1963 issue of Newsweek. CLICK HERE for a biography of Anthony J. Celebrezze from the University of Virginia's Miller Center. 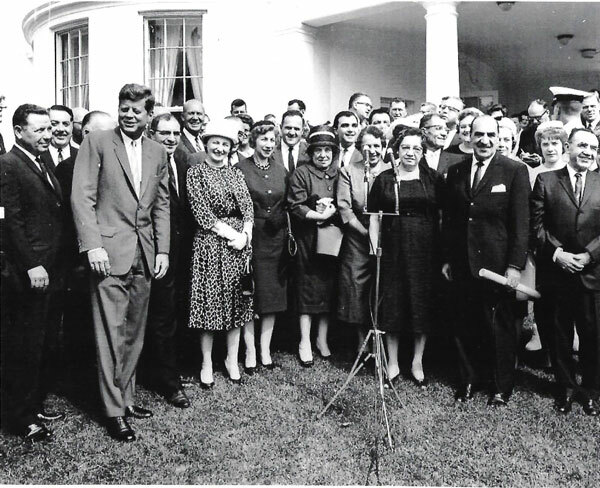 CLICK HERE for a story on Anthony J. Celebrezze joining the Kennedy Administration as Secretary of Health, Education & Welfare, from JFK + 50. CLICK HERE for information on the Cleveland Fire Department's fireboat Anthony J. Celebrezze, from the Cleveland Fire Fighters IAFF Local 93 site. CLICK HERE for the New York Times obituary of Anthony J. Celebrezze. CLICK HERE for the Wikipedia article on the Anthony J. Celebrezze Federal Building. CLICK HERE for the Encyclopedia of Cleveland History's article on the Mayoral Administration of Anthony J. Celebrezze. CLICK HERE for the Ohio Northern University Law Review's 1980 article honoring Anthony J. Celebrezze on his retirement from full-time duties on the U.S. Court of Appeals Sixth Circuit, from HeinOnline. CLICK HERE for a biography of Anthony J. Celebrezze, Sr. on the Ohio History Central website. CLICK HERE for the Social Security Administration's biography of Anthony J. Celebrezze. Thirty Years after his law school graduation Anthony J. Celebrezze received the Ellis Island Medal of Honor, May 1996 - Photos part of John Celebrezze's personal collection. CLICK HERE for the National Italian American Foundation (NIAF) biography of Anthony J. Celebrezze. Anthony J. Celebrezze's life was dedicated to serving the public. He entered politics in 1950, serving in the Ohio General Assembly, and continued his efforts on behalf of others for the next forty-eight years. By the end of his life, he had served in the highest levels of both state and federal governments and had helped transform American law and society. In 1950, Celebrezze ran for a seat on the Ohio State Senate and won. He served as an Ohio state senator from 1951 to 1953. Celebrezze was elected mayor of Cleveland, Ohio in 1953 and served the city until 1962. From 1962 to 1965, Celebrezze served in the cabinets of presidents John F. Kennedy and Lyndon B. Johnson, as the U.S. Secretary for Health, Education, and Welfare. In 1965, President Johnson appointed Celebrezze to the U.S. Court of Appeals for the Sixth Circuit. He served as a federal appeals court judge until his death in 1998. He is buried at Holy Cross Cemetery, Brook Park, Ohio. The U.S. government's building in Cleveland is named after Celebrezze, as well as an archives room at Ohio Northern University's law school (Ada, Ohio). Celebrezze was the father of state attorney general and gubernatorial candidate Anthony J. Celebrezze Jr., and the uncle of Ohio Chief Justice Frank Celebrezze, and Ohio Supreme Court Judge James Celebrezze, the great uncle of Ohio Appeals Court Judge Frank D. Celebrezze Jr., the grandfather of Anthony J. Celebrezze III and the brother of Frank D. Celebrezze I, a Cleveland Municipal Court judge. Anthony J. Celebrezze, a storied Cleveland mayor who transformed the city's skyline in the 1950's and went on to spend three productive years as Secretary of Health, Education and Welfare in the 1960's and three low-key decades as a Federal appellate judge, died on Thursday at a hospice in Cleveland. He was 88 and a founder of a far-flung Ohio political dynasty. Judge Celebrezze's family said the cause was cancer. For all the pride he took in the accomplishments of his nine activist years as Mayor of Cleveland, Judge Celebrezze later admitted that his most sweeping achievements came during his brief service in the Kennedy and Johnson Cabinets. He was appointed by President John F. Kennedy in July 1962, the first Italian-American to serve in a Presidential Cabinet. He remained in the Cabinet until August 1965, when he submitted his resignation to President Lyndon B. Johnson. In that time, Mr. Celebrezze helped shepherd more than a dozen major New Frontier and Great Society bills through Congress, including the Medicare Act, the Civil Rights Act of 1964, the Water Pollution Control Act, the Clean Air Act and the law creating the Head Start program. The most successful Italian-American politician in Cleveland was Anthony J. Celebrezze. Born in Anzi, Italy, on September 4, 1910, he was brought to this country at the age of two. Educated in the Cleveland Public Schools and at John Carroll University, he received his law degree in 1936. His political career began in 1950 when he won election to the Ohio Senate. As a member of several important committees he was twice voted as one of the state's top senators. In 1950, Celebrezze ran for a seat on the Ohio State Senate and won. He served as an Ohio state senator from 1951 to 1953. Campaigning as a independent candidate for Cleveland mayor, who could not be bought, Celebrezze swept into office in 1953. He bucked the party machines to win an unprecedented five two-year terms as Mayor of Cleveland (1953-1962). In 1962 when President John F. Kennedy offered him a position in his cabinet as Secretary of Health, Education and Welfare, now known as Health and Human Services, he accepted. He later served in President Lyndon B. Johnson's cabinet in that same capacity. Anthony J. Celebrezze’s inauguration as Secretary of Health, Education and Welfare with President John F. Kennedy in July of 1962. Bernard L. Boutin (NASA Administrator), Edward Day (Postmaster General), Ted Dsorenson, Robert S. Mcnamara (Secretary of Defense), Donald F. Hornig (Director, Office of Science and Technology), William Wirtz (Secratary of Labor), Anthony J. Celebrezze (Secretary of Health, Education and Welfare), Luther H. Hodges (Secretary of Commerce), Seaborg, (Unidentified Individual), Kennedy, Douglas Dillon (Secretary of the Treasury), John Carver (Undersecretary of the Interior), David Bell (Director, Bureau of the Budget). Behind Dillon is Najeeb Halaby (Administrator, Federal Aviation Administration), Robert F. Kennedy (Attorney General). Washington , D.C. October 18, 1962. U.S. Department of Health, Education and Welfare Secretary Anthony Celebrezze's Visit to National Institutes of Health. Celebrezze took the oath of office as Judge of the United States Circuit Court of Appeals on September 1, 1965. By Act of Congress, the federal building in Cleveland is named the Anthony J. Celebrezze Federal Building. Ten of LBJ's Cabinet member sign a FDC honoring the deceased U.S. President.FDC signed: "Joseph W. Barr", "Clark M. Clifford", "Nicholas deB. Katzenbach", "Ramsey Clark", "Anthony J. Celebrezze", "Henry H. Fowler", "Lawrence F. O'Brien", "Robert C. Weaver", "Robert C. Wood" and "John W. Gardner", 6½x2½. FDC honoring the memory of President Johnson, 8-cent stamp affixed, postmarked Austin, Texas, August 27, 1973. During his many years of serving the public, Judge Celebrezze garnered many honors and awards. Among them were honorary degrees from Fenn College, Boston College, LaSalle College, Ohio Northern University, Rhode Island College, Bowling Green State University, Wilberforce University, Miami University (Ohio) and Cleveland State University. Photograph of Senator John F. Kennedy (right) with Anthony J. Celebrezze (left), Mayor of Cleveland, Ohio and Allen C. Thompson (center), Mayor of Jackson, Mississippi at a meeting of the American Municipal Association held in Denver, Colorado. Stamped on verso: "Photo. By: Ralph H. Hargrove; Identification Bureau, Police Department, Jackson, Mississippi." From the JFK Presidential Library Collection. The Celebrezze family at Mayor Anthony Celebrezze's 1953 inauguration. Former Cleveland Mayor Anthony J. Celebrezze (left) and his son, Ohio Attorney General Anthony J. Celebrezze Jr., laugh as Cleveland Council Presidetn George L. Forbes tells an audience yesterday he would change his name to George Forbes-Celebrezze before running for mayor. The Celebrezzes received Cleveland State University's College of Urban Affairs' "Tribue to the Public Service" award. Taken 11-4-1953, Cleveland Mayor-Elect Anthony J. Celebrezze got a kiss from his wife, Anne, as his victory became a certainty. Source, The Plain Dealer Library 7-26-1962. Taken 5-13-1942, Cleveland Safety Director Frank D. Celebrezze flanked by his parents Dorothy and Rocco Celebrezze at a dinner honoring their son. This photo on loan from John M. Celebrezze was acquired from the Cleveland Press archives. This photo taken by Wm G. Vorpe II, Cleveland News staff reporter on November 10, 1953 at the time of his son's initial election as Mayor of Cleveland. When asked by the media if he was proud of his son, Anthony, the new mayor, he replied, "I am proud of all of my children." Rocco Celebrezze died on November 16, 1954. Anthony J. Celebrezze in the Oval Office with President John F. Kennedy, July 17, 1962. Judge Anthony J. Celebrezze of the U.S. Court of Appeals (6th Circuit) and Mrs. Celebrezze view a portrait of the judge as he looked when he was mayor. The painting was unveiled yesterday at City Hall. The painting. commissioned by Mayor Ralph J. Perk, will be part of the hall's gallery of mayors. With the Celebrezzes are their grandchildren, Catherine and Charles. Photo of Frank D. Celebrezze, Safety Director of Cleveland taken April 21, 1945. Anthony J. Celebrezze , chairman of a Presidential Council on aging, reports to President Kennedy on the Council's year-long study indicating health care issues facing Americans 65 years and older. Eunice Kennedy Shriver watches as Susan Celebrezze helps a handicapped child at Camp Shriver on the Shriver estate in Maryland, July 14, 1964. Anthony J. Celebrezze, Secretary of Health, Education & Welfare, takes his oath from Carson Howell, White House Administrative Officer on July 31, 1962 in the Rose Garden with President John F. Kennedy. President Johnson tosses a pen in the air after signing the Appalochia aid bill. Secretary of Health, Education and Welfare Secretary Anthony J Celebrezze is standing directly behind the President. Mayor Anthony J. Celebrezze with his wife Anne at their Cleveland home, July 14, 1962 as they learned that Mayor Celebrezze was named Secretary of Health, Education and Welfare by President John F. Kennedy. APWirephoto '62. Ohio Supreme Justice James P. Celebrezze, Plain Dealer photo taken by Chris Stephens, March 21, 1984. Frank D. Celebrezze I was born Cleveland, Ohio on May 12, 1899, and died in 1953. He married Mary Carmella Delsander had six children: Frank Jr., Gerald, Dorothy, Joanne, Monica and James. He served as an American judge, the brother of Johnson cabinet member and federal appeals court Judge Anthony Celebrezze. A graduate of St. Ignatius College (now divided into Saint Ignatius High School in Cleveland and John Carroll University in University Heights, Ohio). He earned a Juris Doctor from University of Notre Dame in 1928. In the 1930s, Celebrezze served as a Cleveland municipal judge. Then, Celebrezze served as an assistant prosecutor in the Cuyahoga County, Ohio prosecutor's office. Later, he was director of safety under Cleveland mayors Frank J. Lausche and Thomas A. Burke. Afterwards, he was elected as Cleveland municipal judge until his death in 1953. His other relatives include nephew gubernatorial candidate Anthony J. Celebrezze Jr., son Ohio Chief Justice Frank Celebrezze, son Ohio Supreme Court Judge James Celebrezze; grandson Ohio appeals court Judge Frank D. Celebrezze Jr.; and grandnephew Anthony J. Celebrezze III. Copyright © 2019 Marco & Marco. All Rights Reserved.